The whole island of Bermuda radiates luxury and the iconic, pink Fairmont Hamilton Princess & Beach Club is no exception. Notable past guests include Mark Twain and Sir Ian Fleming and artworks by Andy Warhol and Damien Hurst (among others) adorn the walls. You'll feel like royalty while staying here, so it's no wonder this is one of the most popular hotels to stay at on the island. Our group arrived too early in the morning to check-in. The hotel was kind enough to give us a Fairmont Room in the main building to use as day room and freshen up. The room was comfortable but felt like it would be best for a business traveler. When my Deluxe Garden View room was ready, I was so thrilled to discover there was a patio and lawn area overlooking a little inlet with boats anchored just outside our sliding glass doors. The rose scented Le Labo products were a treat. They make the all marble bathroom feel even more like a spa each time bathe. Housekeeping was incredibly kind, chatting to us in the hallways whenever we passed. Just one example of the authentic, warm hospitality Bermudians regularly exude. I didn't dine at 'the pink palace' for any of my meals, opting instead to explore some of the restaurants downtown Hamilton has to offer. Chef Marcus Samuelsson opened Marcus' in 2015. Though I enjoy Red Rooster here in NYC, I've heard mixed reviews about this restaurant. If I had time, I would have had a drink at 1609 Restaurant and Bar. It looks out over the 60-berth marina behind the hotel. It's also very easy to forget your plans and, instead, spend a whole afternoon lounging at the infinity pool while the attentive staff keeps the rum punches coming. The hotel doesn't have direct access to a beach, but with a free shuttle van that runs regularly to their private beach club, you'll hardly noticed the difference. At the beach club, there are hammocks, beach chairs, water sports gear (like SUP boards and snorkeling gear) as well as an open air restaurant and lockers for your belongings. Back at the property, there is also a gym and small spa. It's a five minute walk to the main ferry port in Hamilton and about a mile walk to the central bus station. The hotel also has a ferry to the sister property Fairmont Southampton. The most fun way to get around the island? Rent a moped from nearby Smatt's Cycle Livery. A girlfriend getaway, a family vacation, and business travelers. The Fairmont Hamilton Princess is located approx. 45 minute drive from the airport and a 5 minute walk away from downtown Hamilton, Bermuda. 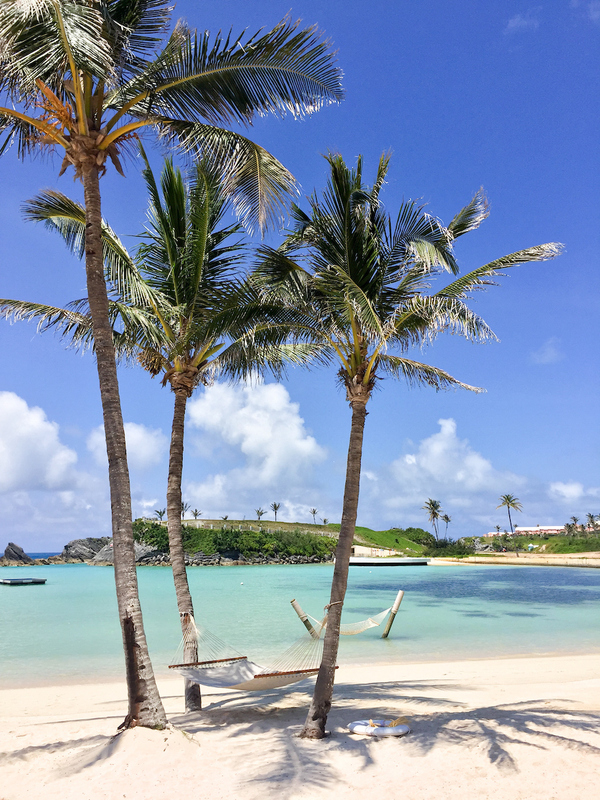 I stayed at the Fairmont Hamilton Princess as a guest of Bermuda Tourism. My opinion is always my own.